One of my best camping memories from childhood involved wandering the beach at Whaling Station Bay on Hornby Island, collecting oysters and bringing them back to the campsite. My family and I would cook them over the campfire and smother the succulence from the sea in garlic butter. For the fourth year in a row the Comox Valley Shellfish Festival is gearing up to celebrate our abundant ocean with a unique event. The festivities start simmering on Saturday, June 19th with a gala soiree on the shoreline of Baynes Sound as diners’ palates will be tempted and teased with a nine-course shellfish feast. Prepared by some of the Comox Valley’s top chefs – as well as Rick Bowman of Monk McQueen’s Restaurant & Patio and Scott Practico of Joe Fortes Seafood & Chop House fame, both from Vancouver – attendees will wine and dine their way through some of the coast’s best offerings. Accompanied by exclusively-provided wines from Beaufort Vineyard & Estate Winery (a personal favourite of mine), this evening promises to be a foodie’s delight. Only 200 tickets are available and can be purchased for $120 each with all proceeds going to the Y.A.N.A. organization, helping local children get the medical treatment they need. 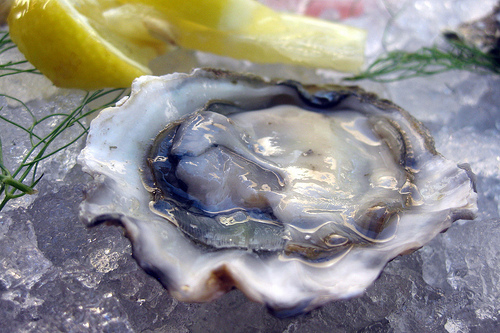 Sunday, June 20th is a day for everyone at Comox Marina Park with a number of sampling booths, desserts, a beer garden, live music and an oyster shucking competition under the sun. Activities start at 11 a.m. and run until 5 p.m.
For more information on the event, and to find out how you can purchase tickets for the gala dinner, please visit the Comox Valley Shellfish Festival’s official website. I’m giving away a $100 gift card from Mark’s Work Wearhouse. Entering is easy, so get your name in the draw before May 29, 2010. As beautiful as that photo is I would have a hard time slurping down a raw oyster!